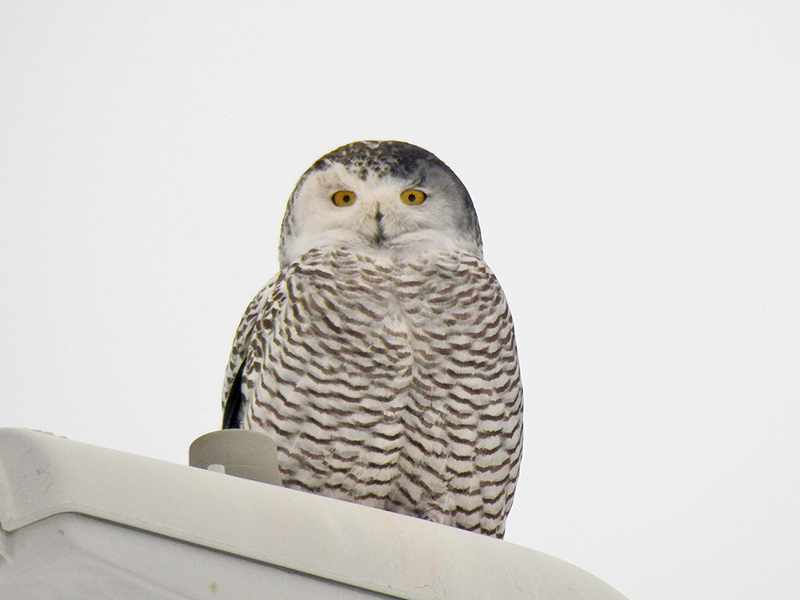 I spent the past several days in northern Minnesota with Laura Erickson for Superb Owl Sunday. We spent most of the time tracking down my “wish list” of northern species I might otherwise not get to see. We drove around the Duluth and Superior area after I arrived on Friday, then up to the Sax-Zim Bog on Saturday. On Sunday we spent some time in the Superior National Forest before heading back into and around town to see what might be around. Finally, on Monday we did a final round of Duluth and Superior, Wisconsin for any last lifers or rarities we could find. 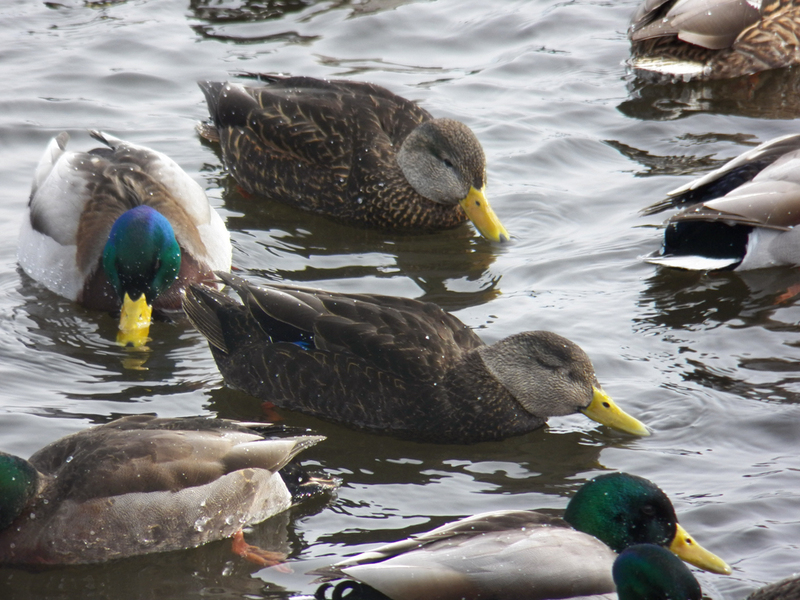 We went to one area on Friday that’s had a Common Eider hanging around with some Mallard and Black Ducks. This is a northwestern variety and not expected in Duluth. There were also quite a number of Common Goldeneyes. My camera had some issues acclimating to the cold at first, so I lost some shots, but the ducks were pretty accommodating. 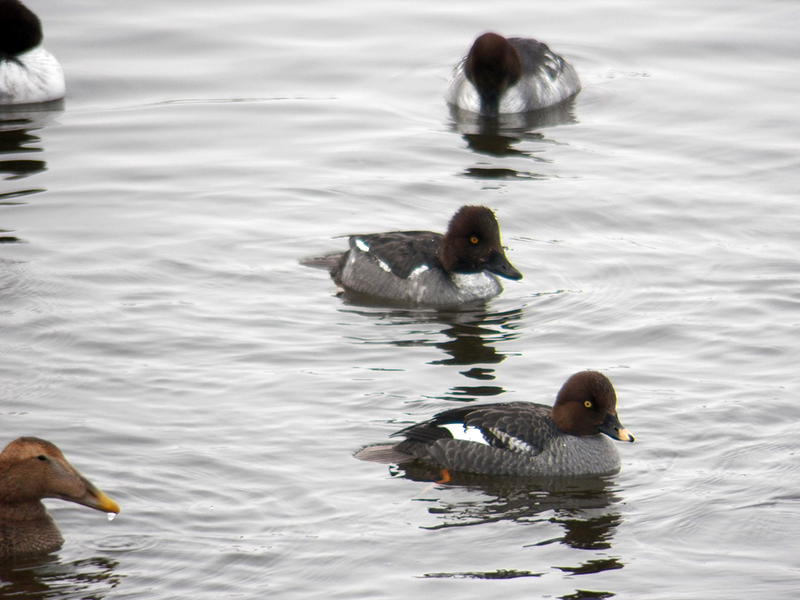 Some Common Goldeneyes and a bit of a photo-bomb from a Common Eider. This is the only surviving shot of the eider I have due to a camera malfunction. While we were about to leave a gull flew in that looked suspiciously like a Thayer’s Gull. Thayer’s Gulls are tricky to tell apart from Herring Gulls (with which they were once considered conspecific). Laura and I scrutinized her photos of the bird at home that night and finally decided we could not confirm it as Thayer’s. But we were to have our satisfaction before the end of my trip. We then stopped by a neighborhood feeder to try for another rarity, a Golden Crowned Sparrow, but had no luck, though we did see my first Black-capped Chickadees in decades. We then drove out to find Snowy and Hawk Owls. We finally did find a Snowy near the airport in Superior. It appeared to be a young female, based on the markings. You can see in the photo below she has a smudge on her left side. This was done by a bander to help keep track of her (and other banded birds) so she isn’t trapped again. She was gorgeous. We drove around some more but never did see a Hawk Owl, before heading to Laura’s home. On Saturday, at the Sax-Zim Bog, we were hoping for more owls and Boreal Chickadees as well as Sharp-tailed Grouse. Our very first bird of the day at the bog was a Great Gray Owl! It didn’t stay in the tree very long, and it was a far look, but I was excited. The day got better as we made the rounds to various feeder stations that residents have set up around the bog. 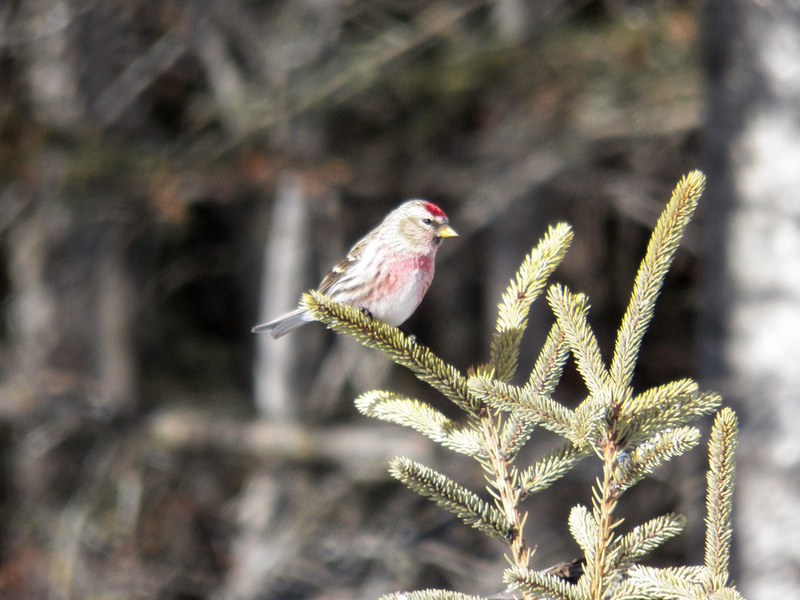 I finally got to see Common Redpolls, as well as Pine Siskins. Common Redpolls and Pine Siskins like to pal around together in flocks ranging from a dozen or so to more than one hundred. With their jaunty red beret-caps and goatees, redpolls look like little beatniks. 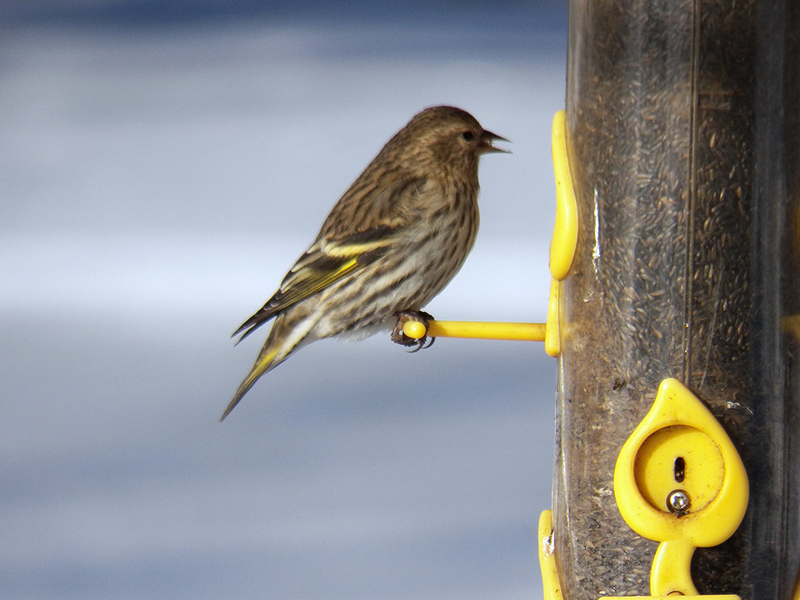 Pine Siskin using its longish, tweezer-like bill to pull seeds from a feeder. 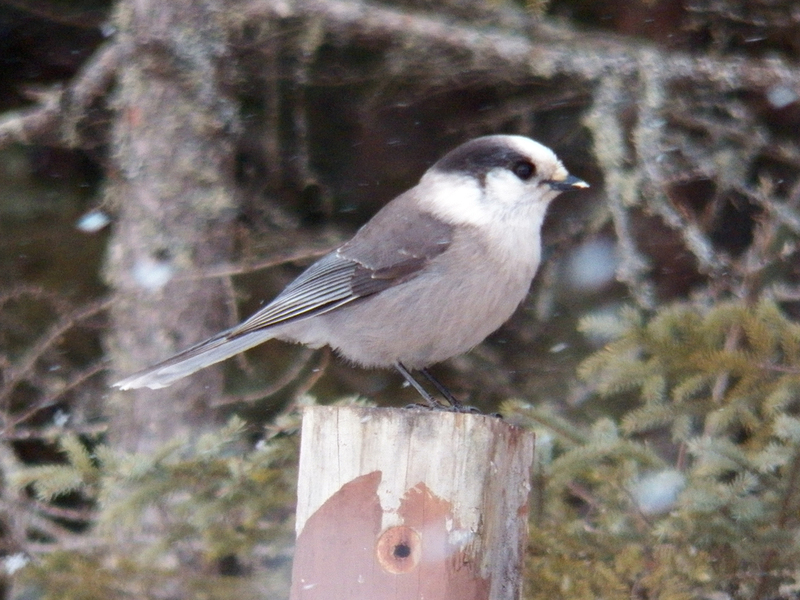 I had my first Gray Jays at the same feeder station where we were hoping for Boreal Chickadees. The jays love peanut butter and were stuffing it by the beak-full. Peanut butter is a good winter food at feeding stations in winter. It has a good amount of protein and fat, and the cold temperatures keep it from going rancid too quickly (although in really cold weather it will eventually freeze). With their cute puff-ball looks, Gray Jays seem like big, cute chickadees, but they are corvids, and when they landed on the feeders, the smaller birds gave them respect and a little distance. There is a persistent misconception that peanut butter is bad or dangerous for birds, but this is just a myth. 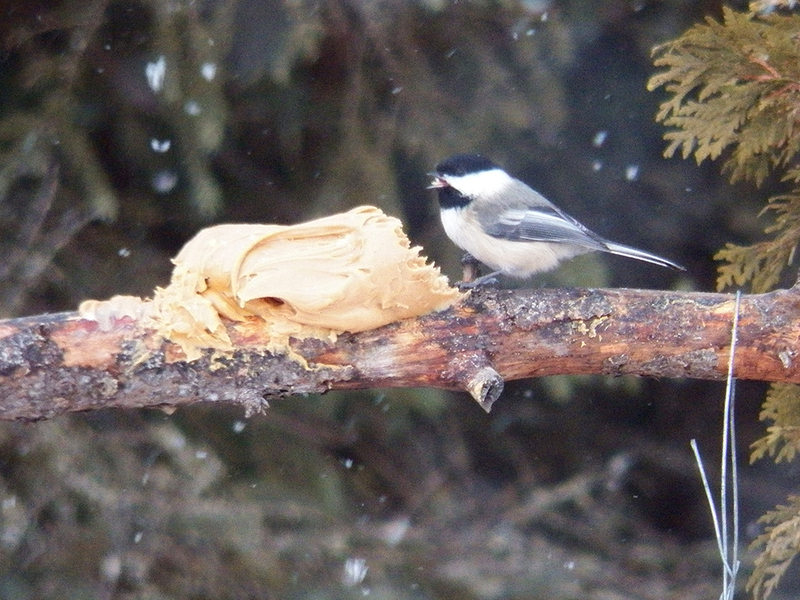 Even the Black-capped Chickadees were into the peanut butter. I managed to get good looks at both Pine and Evening Grosbeaks. 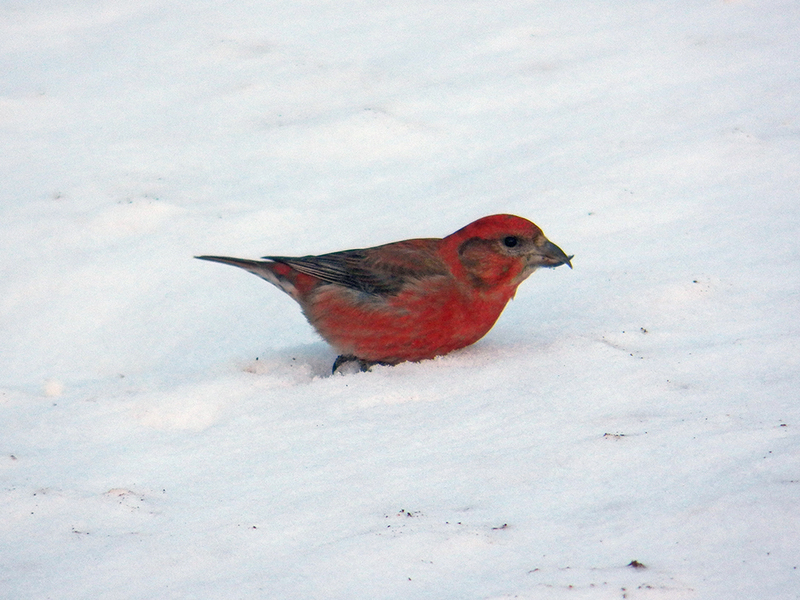 I’ve seen Evening Grosbeaks before, but Pine Grosbeaks are a life bird for me. They are very photogenic, but my camera continued to have issues, so the Pine Grosbeak photos did not properly write to my SD card. 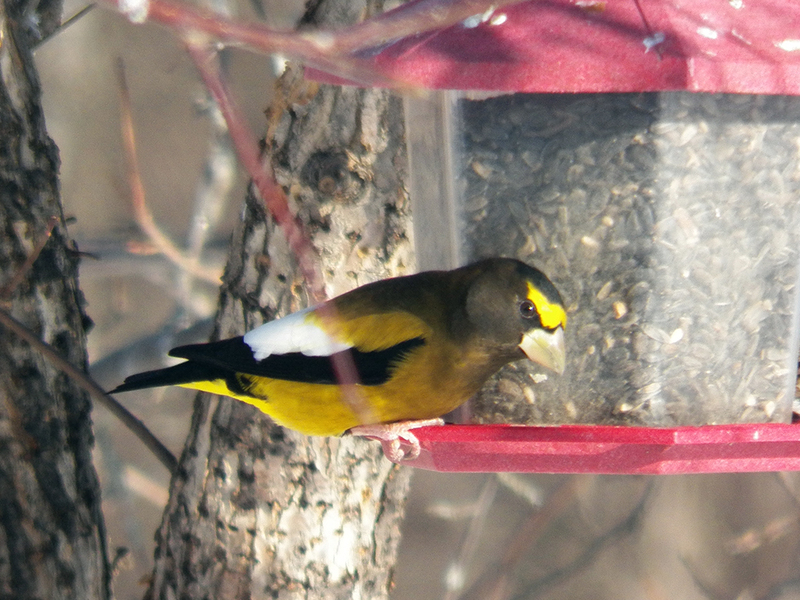 Here’s a handsome Evening Grosbeak, though. “Hey, I’m tryin’ to eat breakfast over heah!” Evening Grosbeaks’ yellow forehead patches make them seem a little aggravated, and this one hung around for just long enough to get a few photos. We started Superb Owl Sunday by driving north into the Superior National Forest. Elevation increases from the lake as you head north, and the temperature dropped from the positive single digits in Duluth to the negative single digits. Laura’s car has an external temperature sensor and it bottomed out at -9 degrees Fahrenheit. There was still at least a hour before sunrise, so the temperature likely dropped further, but it seems the sensor got stuck at -9. I later learned that nearby areas had temperatures in the negative teens that morning, so it’s likely we were at least that cold. The cold wasn’t that much of a problem for me, despite having lived in Florida for 12 years. I grew up in southern New England, and have experienced temperatures nearly that cold on occasion, and I dressed with appropriate layers. The real problem is the wind. In single digit or below temperatures, as long as I was out of the wind it was tolerable for a while. But any time there was a strong breeze or cutting wind, even temperatures in the high teens became unbearable after a few minutes. On the drive into the Forest, we were hoping for Spruce Grouse, and we did get one on the road just after sunrise. It was the only grouse I positively identified for the whole trip (and the first since New Hampshire some 20 years ago). Laura got some photographs (one is shown below) with some good lighting, though vibrations from the car made it a bit fuzzy. Click to enlarge. We saw hundreds more redpolls and siskins as we worked our way north, scattering flocks from the sides of the road. Laura explained to me that redpolls survive the cold nights in part by having esophageal pouches in which they store seeds overnight, digesting and maintaining their metabolism until sunrise. This is a different strategy than other birds use, including torpor or huddling together. A male Common Redpoll keeps look-out while a larger group of mostly females (and Pine Siskins) pick at gravel particles below. 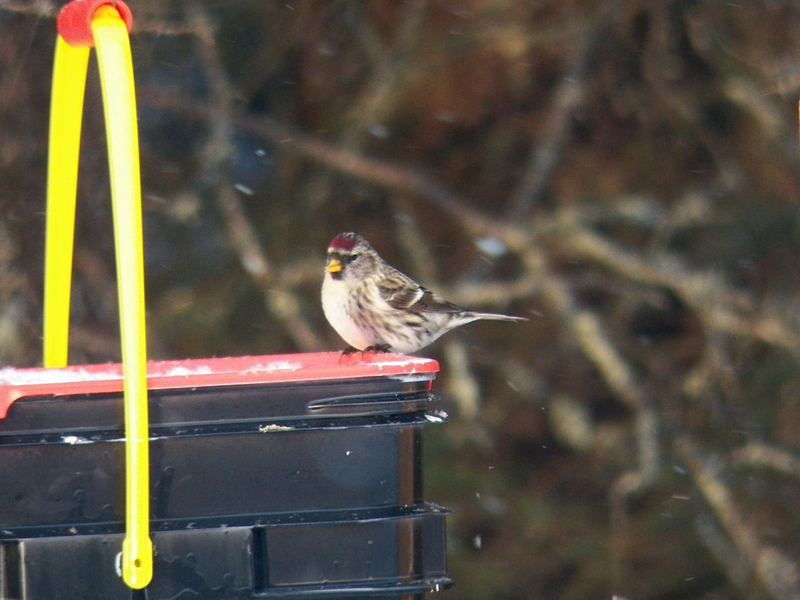 We had some Hoary Redpolls mixed in as well. It’s hard to tell a Hoary Redpoll from a Common Redpoll at a distance, and we had thought we’d seen a few prior to Sunday, but we finally got some good looks at a few this time. 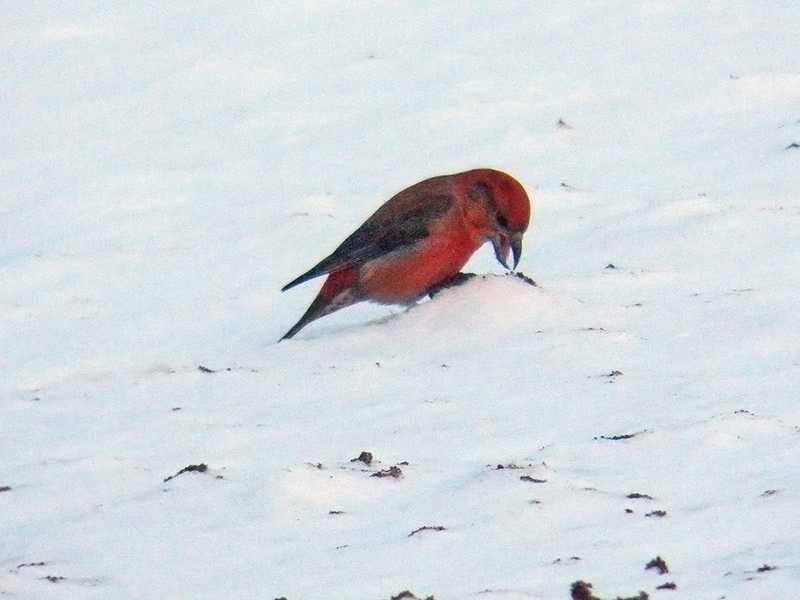 Many of the birds along the roadside were feeding, not on seeds but on pieces of grit and gravel. Birds have no teeth and cannot grind the relatively tough seeds they eat without some help. They ingest grit which works to break down the seeds for digestion. For some birds, they even derive minerals they need from the grit breaking down. The plowed roadsides we were driving past were ideal grit sources as the plows and vehicles kick up ground up stone and gravel onto the snow banks. Even though this image is quite noisy, I wanted to show both the interestingly crossed bill that gives this bird its name, and how the bird was picking up grit from the snow. Of the two possible species of crossbill, I got my life view of the Red Crossbill as a group was foraging on the roadside. As we pulled over, just the male came back down out of the trees to continue his grit collection. He was exceedingly patient and accommodating for us as we moved in closer to get some nice photographs, despite the dim lighting. A male Red Crossbill patiently goes about his business. We drove around the area for most of the morning, hoping for owls and grouse, but not really seeing much. We had pockets here and there of Black-capped Chickadees and Red-breasted Nuthatches as well as flocks of up to 70 Common Redpolls and Pine Siskins. We even got a glimpse of a Bald Eagle on our way down and out of the Forest. The Bald Eagles I saw were much larger and imposing than the ones I am used to seeing in Florida. This makes sense, of course, in that in general larger bodies are better adapted for cold weather. In fact, many of the animals in this area that also occur in Florida are larger, both in terms of basic size, and in the amount of fat reserves they have. We saw a small group of White-tailed Deer cross the road at one point, and it was striking how rounded and tall they looked compared to the deer in Florida. Even the birds will carry more fat and have a much larger number and density of feathers. It took me the entire weekend to finally get proficient and telling the crows and ravens apart (particularly at a moderate distance while not flying) because the crows looked so large. 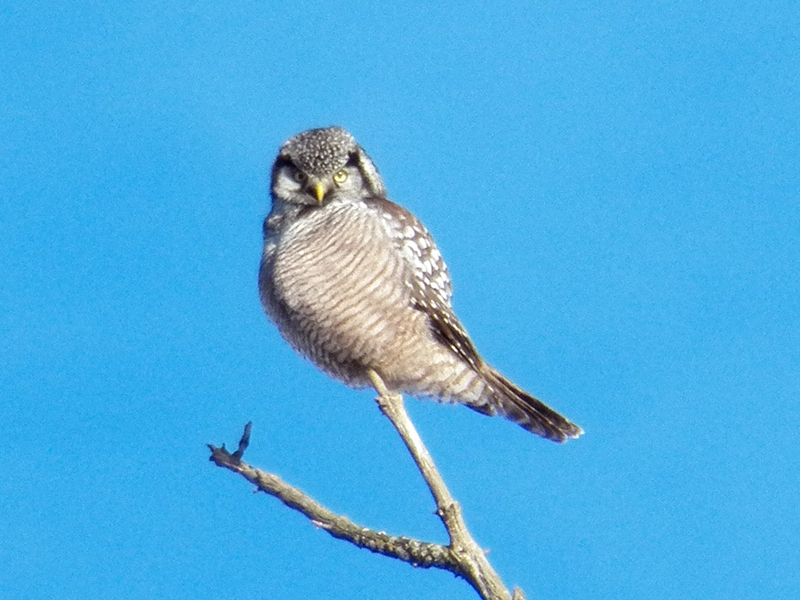 Eventually we headed back toward Duluth and toward an area we had scoped out the previous day that was reported to have a regularly visiting Northern Hawk Owl. As it was Superb Owl Sunday we wanted our best shot at finding at least one owl. As we approached the location, sure enough, there it was! 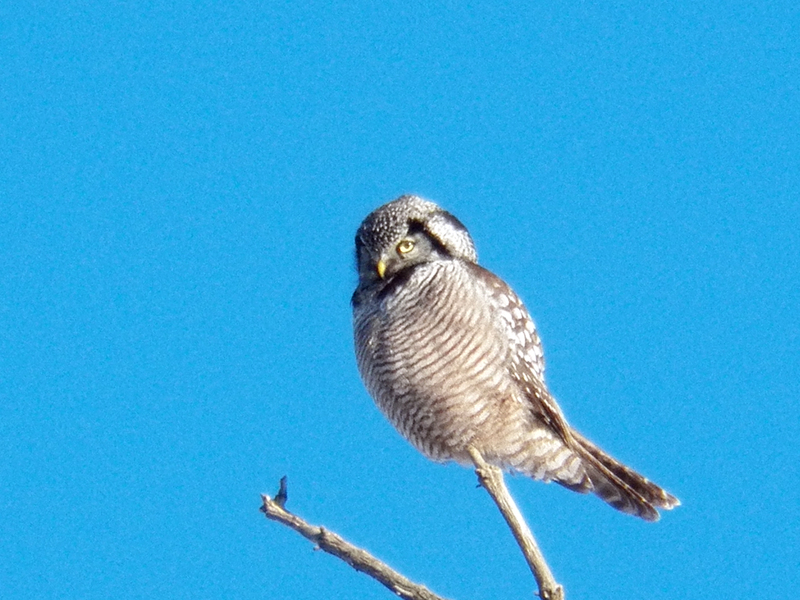 A truly superb Northern Hawk Owl. These owls are very tolerant of humans and it allowed us to take many photos and long binocular looks while it looked around and down at us, seemingly unconcerned about anything we were doing. Hawk owls are generally diurnal, and in aspect and behavior that can be almost kestrel-like. It was a really good way to end Superb Owl Sunday. During my last day in Minnesota we revisited a couple of spots from Friday, hoping to find either Bohemian Waxwings, more owls or anything we might “luck into,” as Laura says. We were hoping to find Rough-legged Hawks, but they remained frustratingly absent. At the middle school in Superior we saw a half-dozen or so Snow Buntings! Last year while looking for a Western Tanager near Lake Apopka (Lust Road) I was surprised by a winter American Goldfinch that, in my over-eagerness, I thought was a Snow Bunting (last winter we had a Snowy Owl in Jacksonville and Snow Buntings reported there and elsewhere, so it wasn’t that big of a stretch). Since then I was really hoping I might see one, finally there they were. We pulled into Barker’s Island park in Superior to see if the Common Eider was still there (she was not) and watched a group of Mallards, Black Ducks and Common Goldeneyes swim and dive. I noticed that some of the Mallards were considerably larger than others. Laura explained that those with a larger percentage of domestic duck genes are bigger than those with more “wild” ancestors. Rather than tipping to forage, the ducks here are grabbing whatever is at the frigid surface of the water. 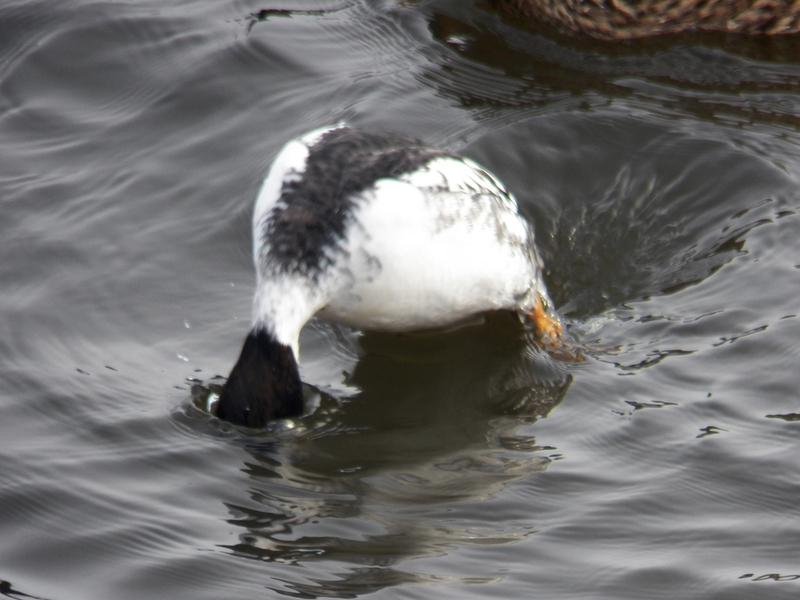 The goldeneyes are small diving ducks, so they were looking for whatever they might find under water. At our last stop, Canal Park, there was a group of gulls sitting on the cement piers. At one point they all took to the sky, and we got a good look at one with decidedly restricted black wing-tips. We had our Thayer’s Gull after all, and I had at least one lifer for each day! Despite the disappointment in losing some of my photographs due to either a malfunctioning SD card or the cold, I had a tremendously great time in and around Duluth. Laura and her family were generous and kind in sharing their home with me. I got to watch both The Big Year (extended cut, with John Cleese!) and A Birder’s Guide to Everything with Laura, and several McGuyver episodes, too! Thank you Laura, Russ, Helen and Tommy.